Experience Sachsenhausen Concentration Camp, just north of Berlin, on this private 2-hour tour. 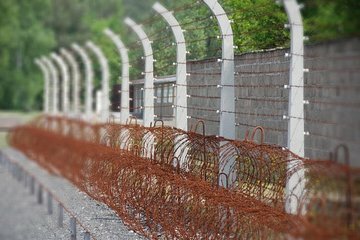 Together with a dedicated guide, you'll traverse the concentration camp that imprisoned thousands and murdered many between 1936 and 1945. Visit some of the remaining buildings and grounds, learn about the history of the camp and the Nazi Party, and gain insight into this tragic period in history. Our tour guide, Axil, was terrific. Throughly enjoyed the tour and would recommend it to all. Took the tour on September 17. We were only five minutes late coming down to meet our guide, as he did not call my phone to say he had arrived. Once we reached the camp, he repeatedly said we must move on because we started so late and did not have time. This was after he spent at least 20 minutes showing us a map. He wanted us to not go into the houses, or the kitchen where the prisoners had been sent. He said to just look in the windows, which we refused. A few times, when he was giving us information, we continued to walk around while listening. He kept asking us if we didn't want him to give the tour. He wanted us to just look at him while not viewing the camp. He could have given us his tour in the lobby of the hotel. At one point, we asked if we could just call a taxi back so we could spend some time looking around. he became even ruder. He did not speak to us the entire ride back to the hotel. I would have liked to see more of the living conditions, and less of the maps etc. We ended up going down to the kitchen while he stood outside because he did not want to go there. I have been on many tours and this guide was the worst I have ever had. Guide was great, but very rushed in 2 hours. We read very little of the personal details and could have spent hours more. Our guide Axel was awesome... He gave us great info about the city as we drove in and out and shared, sensitively, a lot of details about the camps and kept us moving so we saw a great deal. He was very knowledgeable and courteous. We were extremely pleased. HIGHLY RECOMMENDED! We had a wonderful tour to Sachssenhausen Concentration Camp with our tour guide and driver. They were both very helpful and informative throughout our tour to the Concentration Camp. We were picked up at our hotel and driven the 40 mins. to the Camp. Our tour guide gave us quite a bit of information on our way to the Camp and then he privately toured us around the Concentration Camp giving us detailed information about life at the Camp. He answered all of our questions and was extremely knowledgeable about the Concentration Camp. He and the driver even gave us information on where to shop, eat and visit in Berlin on our way home. We only had two days in Berlin and this tour was perfect! It was well worth the money to hear all the information in 4 hours! Great tour! Our guide was very thorough and knowledgeable. We had a limited amount of time and our guide, Daniel, ensured that we covered as much as possible during our visit. I would highly recommend him. Our private tour to the Sachsenhausen Concentration Camp was a very moving experience. Our guide Daniel was very prompt, very friendly, and very good at describing what we were seeing and answering all of our questions. Going on a private tour is much more personal and satisfying than going on a big group tour. We really enjoyed our day and would recommend this tour! It was a highlight of our trip to Germany...our tour guide and driver were informative, friendly and very educational! It was a 10! The tour was an emotional one for us because the grandfather of my husband was a prisoner here. Our guide was very well-versed and knows the history very well. However, when we returned to our van, our driver Angelica shouted at our guide and said that we were late and that she had somewhere else to go. We were just following our guide the whole time and there was never an indication that we were late. Besides, it was approximately a 4-hour tour so we were not late. We left Berlin at 9 am and went back to our van at around 12.30 pm. If the driver had a problem with our guide, she should have spoken to here quietly and not in front of use, the clients. Very unprofessional to do that.